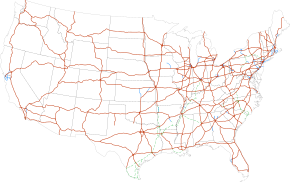 The auxiliary Interstate Highways (also called three-digit Interstate Highways) are a supplemental subset of the freeways within the Interstate Highway System of the United States. Similar to the mainline Interstate Highways, these highways also meet all Interstate Highway Standards (with rare exceptions), they receive the same percentage of federal funding (90%), and they comply with other federal standards. Auxiliary routes are generally classified as spur routes (which connect to the parent route at one end), bypasses (which connect to the parent route at both ends), or beltways, which form a complete circle intersecting the parent route at two locations. There are some routes which connect to the parent route at one end, but connect to another route at the other end; some states treat these as spurs while others treat them as bypasses. These shorter auxiliary routes branch off of main routes and are numbered based on the number of the parent route, such that all I-x95 routes are supplemental routes for I-95. While some exceptions do exist, generally spur routes are numbered with an odd hundreds digit (such as I-395), while bypasses and beltways are numbered with an even hundreds digit (such as I-695). Because longer interstates may have many such supplemental routes, the numbers may repeat from state to state along their route, but they will not repeat within a state. Routes that begin with an even number generally connect to the main highway in two locations, while odd numbers only connect in one location. The basic tenets of the auxiliary Interstates are divided into three branches: spur, loop, and bypass routes. Each one signifies a different characteristic of the auxiliary route. The first digit of the three digits usually determines whether a route is a bypass, spur, or beltway. The last two digits are derived from the main Interstate Highway. For instance, I-515 contains an odd number in the first digit (5), and this indicates that this freeway is a spur. The last two digits signify the highway's origin. In this case, the "15" in I-515 shows that it is a supplement to I-15. Numerous exceptions to the standard numbering guidelines exist in many places. This can be for a number of reasons. In some cases, original routes were changed, extended, or abandoned, leaving discrepancies in the system. In other cases, it may not be possible to use the proper number because the limited set of available numbers has been exhausted, causing a "non-standard" number to be used. It may serve another section of a city or metropolitan area not served by the main freeway (most often the central business district), terminating at a regular city street/avenue or at a substandard freeway, such as I-180 in Lincoln, Nebraska. It may represent the first portion of a contemplated extended freeway, one that downgrades to below Interstate standards with plans to upgrade it later on. An example is I-540 in Arkansas. It may connect two unrelated Interstate highways—such as I-390 in New York State and I-355 in Illinois do. Note that states differ on their interpretation of the numbering convention in this case. In the I-390 example above, the route has both ends at Interstates, but not at the same Interstate on both ends, and is assigned an odd first digit. Another example is I-275 in Tennessee: it is a connector between I-40 and I-75 (a similar case of having both ends at Interstates but not at the same Interstate) and is assigned an even first digit. I-110 in California links I-10 with the Port of Los Angeles. This freeway was built before Interstate Highways as the Harbor Freeway. Later, it was adopted into the Interstate Highway System. I-180 in North-Central Pennsylvania connects Williamsport and Lycoming County with I-80 in Milton, which does not actually enter Lycoming County. I-180 also serves as a connection to those traveling to New York and I-86 via U.S. Route 15 and the Future I-99 Corridor at its western terminus. I-190 in New York connects the cities of Niagara Falls and Buffalo with I-90. Sometimes, a three-digit Interstate Highway branches off from another three-digit Interstate Highway. These spurs do not connect directly with their parent highways, but are associated with them via the three-digit highways they do intersect with. I-380 in Northern California is located at the San Francisco Bay Area. This highway begins at I-280, and it connects with US 101 and San Francisco International Airport. I-190 in Massachusetts branches off from I-290 near Worcester. I-795 in Baltimore County, Maryland branches off from I-695. A bypass route may traverse around a city, or may run through it with the mainline bypassing. In a typical 3-digit Interstate Highway, bypasses usually have both its two termini junctioned with another Interstate highway. Bypass routes are preceded by an even number in the first digit. I-215 in Utah travels part of the perimeter of Salt Lake City. I-220 in Louisiana serves as a bypass of downtown Shreveport. I-440 forms a loop around the south side of Nashville. In the case of an auxiliary Interstate highway which has both ends at Interstates but not the same Interstate, some states treat these as bypasses while others treat these as spurs — see Spur route above. A beltway (also known as a loop route) completely surrounds a metropolitan city, and it is often connected with multiple junctions to other routes. Unlike other auxiliary Interstate Highways, beltways do not have termini; however, they have a place where the highway mileage resets to zero. Beltways are also preceded by an even number in the first digit. I-275 in Ohio, Kentucky and Indiana encircles the city of Cincinnati. I-465 in Indiana encircles the city of Indianapolis. I-495 in Maryland and Virginia encircles the city of Washington, D.C. and is referred to as "The Capital Beltway". Note: the table sorts the route numbers by parent highway. 48.72 78.41 I-5 in Sylmar, CA SR 57/SR 210 in Glendora, CA 01964-01-011964 current Segment from SR 57 east to I-10 is still signed as SR 210, formerly SR 30 prior to 2007. 2.39 3.85 I-80 in Salt Lake City, UT 4430 S in Holladay, Utah 01965-01-011965 01969-01-011969 Designation was scrapped to provide a single route number 215 for the entire route. — — I-20/I-59/I-459/US 11 in Bessemer, AL I-59 in Argo, AL proposed — If built, it will have no direct connections to I-22. 3.50 5.63 Tenaha, TX Texarkana, TX 02013-01-012013 current Partially completed in 2013. Eventually, it will surpass I-476 as the longest Auxiliary Interstate in the country. 22.8 36.7 I-85/I-85 Bus./US 29/US 52/US 70 near Lexington, NC I-40/US 52/US 311/NC 8 in Winston-Salem, NC 02018-01-012018 current An unconfirmed section of Future I-285 is to continue north of I-40 for 10 miles (16 km) along US 52, through downtown Winston-Salem, to the proposed Winston-Salem Northern Beltway. 3.44 5.54 — — — — Replaced by I-595. — — — — — 01987-01-011987 Withdrawn from request, replaced by MD Route 3. ^ According to the FHWA, I-275 in Michigan is only 29.97 mi (48.23 km) because they do not count the length overlapping I-96. MDOT and most major map publishers do count the overlap. ^ a b c DeSimone, Tony (October 31, 2002). "Interstate Route Numbering". Route Log and Finder List. Federal Highway Administration. Retrieved February 3, 2008. ^ a b Adderly, Kevin (December 31, 2015). "Table 2: Auxiliary Routes of the Dwight D. Eisenhower National System of Interstate and Defense Highways as of December 31, 2015". Route Log and Finder List. Federal Highway Administration. Retrieved February 6, 2016. ^ Special Committee on U.S. Route Numbering (December 8, 1990). "Report of the Special Committee on U.S. Route Numbering to the Executive Committee" (PDF) (Report). Washington, DC: American Association of State Highway and Transportation Officials. Archived (PDF) from the original on October 16, 2017. ^ Warring, KS (January 2, 2008). "Interstate 905 Freeway Interchanges" (PDF). California Numbered Exit Uniform System. Sacramento: California Department of Transportation. Retrieved February 5, 2009. ^ Cavanaugh, Patricia (October 2006). "Politics and Freeways: Building the Twin Cities Interstate System". University of Minnesota. ^ Tennessee Department of Transportation (October 31, 2003). "TDOT Announces Decision on State Route 840 North" (PDF) (Press release). Tennessee Department of Transportation. Archived from the original (PDF) on November 27, 2007. ^ Federal Highway Administration (October 31, 2002). "Table 2: Auxiliary Routes of the Dwight D. Eisenhower National System of Interstate and Defense Highways as of October 31, 2002". Route Log and Finder List. Federal Highway Administration. Retrieved July 8, 2007. ^ Dozier, Daniel A. (September 5, 2013). "Request for I-69 Designation for I-164 from I-64 to US 41" (PDF) (Letter). Letter to Richard J. Marquis. Indianapolis: Indiana Department of Transportation. Retrieved January 9, 2015 – via American Association of State Highway and Transportation Officials. ^ Highway Information Services Division (December 31, 2013). Highway Location Reference. Maryland State Highway Administration. Retrieved March 2, 2012. ^ a b c Michigan Department of Transportation & Michigan Center for Shared Solutions and Technology Partnerships (2009). MDOT Physical Reference Finder Application (Map). Michigan Department of Transportation. Retrieved February 6, 2016. ^ Rand McNally (2008). "Michigan: Cities" (Map). The Road Atlas. 1 in≈5 mi. Chicago: Rand McNally. p. 52. Detroit & Vicinity inset. § I3. ISBN 0-528-93981-5. OCLC 226315010. ^ Google (February 24, 2010). "Overview Map of I-275" (Map). Google Maps. Google. Retrieved February 24, 2010. ^ "Ask SAM: Upgrades needed before US 52 can be called I-285". Winston-Salem Journal. January 10, 2014. Retrieved January 10, 2014. ^ "NCDOT: Project U-2826". Retrieved April 17, 2014. ^ "State Seeking Future Interstate Designation for US 264 to Greenville". North Carolina Governor's Office (Press release). Retrieved November 10, 2016. ^ Borggren, Erica J. (6 October 2014). "I 490 Illinois Establish" (PDF). Archived from the original (PDF) on 3 March 2016. ^ DeBonis, Mike (November 28, 2011). "Interstate 695 Reappears in D.C." The Washington Post. ^ Highway Information Services Division (December 31, 2013). Highway Location Reference. Maryland State Highway Administration. Retrieved September 24, 2012. ^ Special Committee on U.S. Route Numbering (September 24, 2017). "Special Committee on U.S. Route Numbering" (PDF) (Report). Washington, DC: American Association of State Highway and Transportation Officials. p. 4. Retrieved October 21, 2017. This page was last edited on 7 April 2019, at 23:25 (UTC).